New Construction Defects | FYI Inspections, Inc. This was a new construction home inspected early this year. 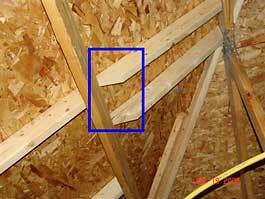 The trimmer rafters were cut backwards and only bearing on one inch or less on the roof trusses. A house full of carbon monoxide and possible fire would be the result if this fireplace had been used. 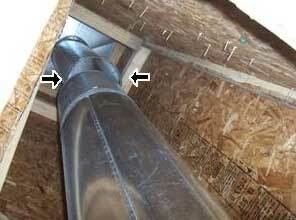 The flue was disconnected in the chimney stack and was visible from the attic space. The client actually had this new construction home inspected the day after they moved in. They considered having wine in front of the fireplace their first night their their new home, which sadly could been their their last night !!! Although this is not the norm it is often that I find these and other issues such as switches improperly wired, ungrounded receptacles, hot and cold water lines reversed on newly constructed homes and buildings.